We can select or deselect a range of records between any two records in a table window using fast and easy mouse commands. We will use a table showing the locations of archaeological sites in France. 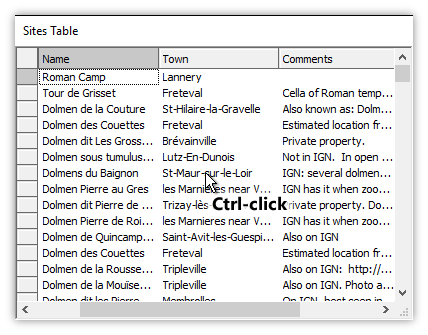 We begin by Ctrl-clicking on the record at St-Maur-sure-le-Loir to select that record. Selecting the record by Ctrl-clicking the record also moves the cursor to that cell. If the record for St-Maur-sur-le-Loir has already been selected, we could have clicked that record to move the cursor onto that record. Next, we Shift-Ctrl-click on any cell within the desired end record for the range of records we wish to select. 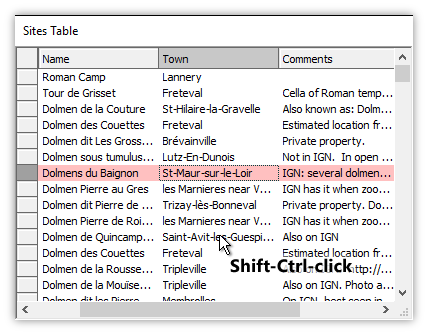 The record we have Shift-Ctrl-clicked is selected, as are all the records in the range between that record and the St-Maur-sur-le-Loir record where the cursor had been positioned previously. The cursor now is on the last record that we Shift-Ctrl-clicked. To deselect a range of records we first click a starting record that is not selected to move the cursor onto that record. For example, in the illustration above we click on the Freteval record to move the cursor record onto that record. Clicking a record does not select it, but simply moves the cursor onto that record. With the cursor on the Freteval record we Shift-Ctrl-click onto the record for Dolmen Pierre au Gres. Because the cursor starts on a record that is not selected, Freteval, Manifold knows we want to deselect all records from that cursor record to the Shift-Ctrl-clicked record. 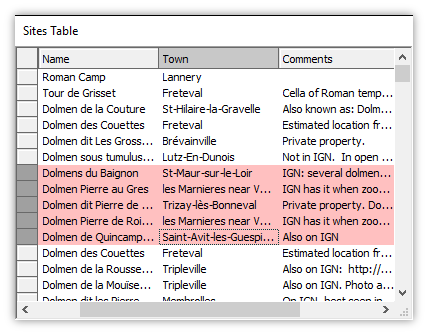 The record for Dolmen Pierre au Gres is deselected and all records between it and the previous cursor record for Freteval are also deselected. 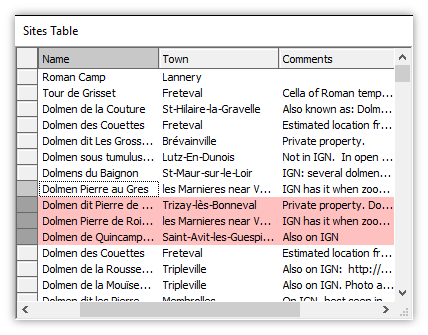 The cursor is now on the last-clicked record, for Dolmen Pierre au Gres. Example: Mouse Selection in a Drawing Window - Using the mouse to select objects in a drawing window. This could be a drawing layer in a map or simply in a drawing window. SQL Example: Using Selection Query Functions - How to manipulate selections within a query. Example: Using the Select Panel Template Tab - A sequence of actions using Select panel templates. Manifold Future - Shared Selections - Interactive selections in Manifold Future and Future Viewer provide a quick and easy way to zero in on data of interest. 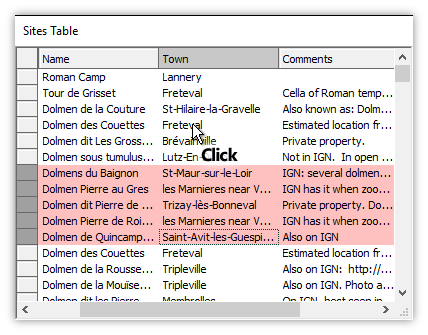 This video shows how windows share a selection so selecting records in a table will automatically select the corresponding objects in every drawing that shows that table. Likewise, making a selection in a drawing will automatically select the corresponding records in the table as well as in all other drawings and drawing layers that display that table. Manifold Future - Five Minutes for Fast Map Selections - Reproduces examples in this topic in video form. Mouse selection moves can be much easier to understand when seen in a video than described in words in this documentation.